The careful reader of Basically Bertram might have noted that posts severely decreased starting in August 2008--precisely the same time that I (aka Parental Unit #1) discovered that I was pregnant with baby no. 2. 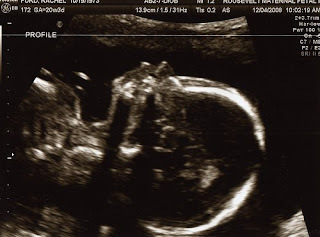 This elusive, still developing being is now 22 weeks old, but the above anatomy scan points to a clear gender: girl. Thus, young Master B will soon shed his only child status and become a BIG BROTHER. Part of me feels that I am robbing my little son of his solo babyhood as baby no. 2 is scheduled to arrive on April 13--two weeks before young Master B's 2nd birthday. Another part of me is excited that Bertram will have a sibling who is so close in age--hopefully, they will play together and not drive each other bananas. I can only imagine that Bertram comprehends that the "baby in the belly" is a big pain in the pahtooty. As in, "Bertram you can't bounce on mommy anymore because of the baby in the belly." Or "Be careful not to kick me--remember the baby in the belly." Or "Mommy can't carry you right now, she's too tired from carrying the baby in the belly." Sometimes, I hold up young Master B's baby doll, hold in front of my belly, and say "look it's the baby in the belly." I don't get a response. Bertram looks at me with a kind of "what do you mean, silly woman" expression. In the meantime, I get bigger, just 17 weeks to go.